Humanity’s need for information grows exponentially by the day — we need it now, and we need it on the go. For millions of people worldwide, mobile devices have become a lifeline. Today, smartphones and tablets are not just means of communication; they are also mobile offices, with access to the Internet, email, a number of IM agents (i.e. What’s App, Facebook Messenger, Skype) and video cameras that can be used for calls and conferences. And as if this wasn’t enough, most mobile devices are equipped with GPS tracking systems that help users reach their destination with greater efficiency, and an incredible selection of apps and games for entertainment while out and about. With people are becoming increasingly dependent on their mobile devices, it’s never been more important for your business to get the best exposure on the various app stores, and in your customers’ homescreens. HireRussians is proud to offer a 30-strong Mobile Development Team with extensive experience in the development of apps and mobile solutions for smartphones and tablets. Over time we’ve delivered more than 600 high-performance apps, including native apps, mobile web apps and cross-platform apps for both innovative enterprises and start-ups. Do you need an Android developer or an iPhone app? Look no further — we have Apple and Google covered, and more. To satisfy all your needs, our team also includes graphic designers and interface designers — and best of all, the project management fee is on us! Integrations: Amazon S3, Apple Push Notification Services, Facebook, Twitter, Instagram, Tumblr, VK.com, Google Maps, YouTube, etc. 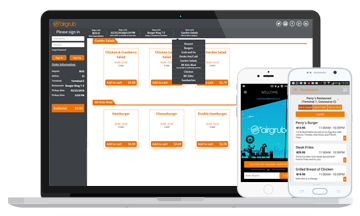 AirGrub provides a life-changing service of ordering food in airport restaurants via Android and web applications. User can place an order beforehand, eliminating the need to rush, stand in lines and even have a wallet on hand. The app tracks the info on user's flight, signaling in case of any delays or changes of the gate, allowing to update and fix the order. Expense reports are no problem either — the receipts are emailed to the user straight away. I enjoy working with you. Overall we are very happy with HireRussians. 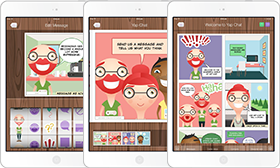 An instant messenger developed specifically for iPad allows to turn everyday casual conversations into fun comic book. With vector multi-layer editor users of YAP Chat can create cartoon-like images, consisting of background, characters with selected emotion and additional elements, such as speech balloons and side annotations. I just wanted to thank you and your talented team for assisting me to bring Yap Chat to life. 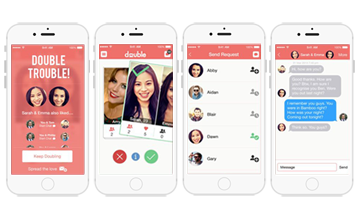 Apple finally approved the application. This is a significant achievement and I could not have done this without HireRussians.